Harry Nicholas Disch, a Maud merchant and undertaker whom Wilbanks owed money, filed a petition on 2 March noting “That there are no surviving wife, children of age desiring administration, father or mother, brothers, sisters or grand-children, or next of kin entitled to share in the distribution of the estate” and that he was “praying that letters of administration be issued to” Ezekiel Lafayette Alexander. Alexander was a close friend to Wilbanks. Both men had after 1900 come to Oklahoma Territory from Searcy County, Arkansas. With Alexander’s appointment as administrator approved by the probate court, he set about settling Wilbanks’ estate. He placed a notice to creditors in the weekly Maud Monitor newspaper three times between 8 March and 22 March. The firm Ogee, Tinkle and Disch was owed the cost of two coffins: one for Edgar Wilbanks at $27.50, and one for Lewis H Wilbanks at $15.00. Lewis was Edgar’s son from his first marriage. Lewis died exactly seven days prior to Edgar. Ezekiel Alexander filed his own claim against the estate for the cost of a burial plot at Cummings Cemetery for Lewis. He also assumed guardianship of Wilbanks’ three minor sons: James, 17; Rueben, 15; and Bert, 12. Wilbanks had the distinction of being a Civil War veteran of a Union battalion from a Confederate state. His family resided in Georgia during the war, and at the age of seventeen Wilbanks enlisted in Company A, First Battalion of Georgia Infantry (Union), wherein he held the rank of private. The battalion was assigned to guard railroads in north Georgia during the waning months of the war. Wilbanks was mustered out of service on 19 July 1865, having served only nine months of his three year enlistment. Since 1891 he had been drawing an invalid class pension from the federal government. On 27 March, Alexander filed for a minor class pension on behalf of Wilbanks’ boys, based on their father’s war service. Meanwhile, Wilbanks’ body was apparently conveyed back to Searcy County, Arkansas for burial at Bear Creek Cemetery. He was evidently interred with his second wife Nancy White Wilbanks and near his deceased daughters Louisa Wilbanks Treadwell and Mary Wilbanks Bohannon. Lewis H Wilbanks was living in the household of James Monroe Jordan in Earlboro, Pottawatomie County, Oklahoma Territory according to the 1900 census. James Jordan was the father-in-law of Ezekiel Alexander, who married Minnie Jordan in Searcy County, Arkansas in October 1900. Find A Grave has a photograph on Edgar Wilbanks’ memorial of a grave marker that appears to be for his wife, Nancy. The marker mentions Edgar in the context of calling Nancy “wife of Edgar…” but does include his birth and death dates. Because of the context, it’s not certain that Edgar was actually buried in Bear Creek Cemetery. Ancestry.com. 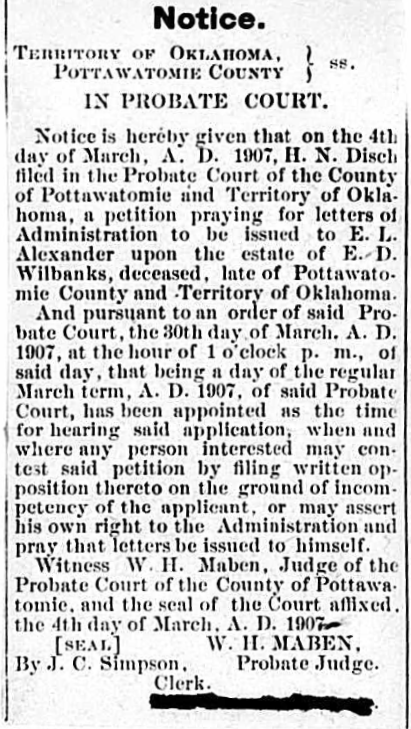 Oklahoma, Wills and Probate Records, 1801-2008 [database on-line]. Provo, UT, USA: Ancestry.com Operations, Inc., 2015. National Archives and Records Administration. U.S., Civil War Pension Index: General Index to Pension Files, 1861-1934 [database on-line]. Provo, UT, USA: Ancestry.com Operations Inc, 2000. Ancestry.com. U.S., Union Soldiers Compiled Service Records, 1861-1865 [database on-line]. Provo, UT, USA: Ancestry.com Operations, Inc., 2011. Ancestry.com, U.S., Selected Federal Census Non-Population Schedules, 1850-1880 [database on-line]. Provo, UT, USA: Ancestry.com Operations, Inc., 2010. Ancestry.com, Georgia, Marriage Records From Select Counties, 1828-1978 [database on-line]. Provo, UT, USA, Ancestry.com Operations, Inc., 2013. Ancestry.com, Tennessee, Compiled Marriages, 1851-1900 [database on-line]. Provo, UT, USA, Ancestry.com Operations Inc, 2000. Ancestry.com, Arkansas, County Marriages Index, 1837-1957 [database on-line]. Provo, UT, USA, Ancestry.com Operations, Inc., 2011. Ancestry.com. U.S. WWII Draft Cards Young Men, 1940-1947 [database on-line]. Lehi, UT, USA: Ancestry.com Operations, Inc., 2011. Ancestry.com, 1870 United States Federal Census [database on-line] Provo, UT, USA, Ancestry.com Operations, Inc., 2009. Ancestry.com and The Church of Jesus Christ of Latter-day Saints, 1880 United States Federal Census [database on-line]. Lehi, UT, USA, Ancestry.com Operations Inc, 2010. Ancestry.com, 1900 United States Federal Census [database on-line] Provo, UT, USA, Ancestry.com Operations Inc, 2004. Find A Grave, memorial page for Lewis H. Willbanks, Memorial no. 102170286. Find A Grave, memorial page for Edgar Daniel Wilbanks, Memorial no. 44998464. Find A Grave, memorial page for Nancy Jane Wilbanks, Memorial no. 14316713. Find A Grave, memorial page for Louisa Treadwell, Memorial no. 14316840. Find A Grave, memorial page for Mary Frances Bohannon, Memorial no. 14316732. Wikipedia contributors. “Maud, Oklahoma.” Wikipedia, The Free Encyclopedia. Wikipedia, The Free Encyclopedia, 27 Jan. 2019. Web. 16 Feb. 2019. Wikipedia contributors. “1st Georgia Infantry Battalion (Union).” Wikipedia, The Free Encyclopedia. Wikipedia, The Free Encyclopedia, 17 Jun. 2018. Web. 16 Feb. 2019. WOW that is very interesting to me – thanks Byron for posting this and all you have posted to this point!!! I love reading abt the history of our different families of Searcy County!!! Researching and writing these articles keeps me off the streets! Glad you enjoyed it.